Auralite Super 23 Crystal is a new discovery of hand mined crystals from Canadas sacred Cave of Wonders remotely nestled far north of Lake Superior within the Boreal Forest of the Canadian Sheild. Auralite is a rare Canadian gem and energy stone. Meditating with Auralite crystal has a large volume of energy coming from them. They are much stronger than Amethyst. When this stone is held at the crown chakra, its pulsations move fully through the brain activating both the crown and third eye chakra giving you the sensations of peace and tranquility in the mind. Auralite gives you a quality of deep meditation, quieting the mind and calming the emotional body. Auralite can instigate a process of inner purification, cleansing various knots of negative fixation. Auralite helps to dissolve ones cares and worries, release patterns of anxiety, resentment, judgement, depression and defeat. Auralite uplifts ones spirit and an awakening to the potential of a new life, optimism and new hope. 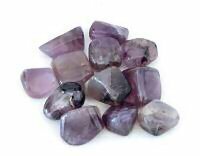 Auralite enhances psychic sensitivity, insight into truth, disappearance of chronic problems with the body, lucid dreaming and experiences with angels. Auralite makes an excellent stone tool for spiritual healing. This is a stone of regeneration and rejuvenation. It helps heal the soul through the remembrance of past lives. It encourages you to recognize the blessings on ones life. Super 23 Aaualite Crystal has been scientifically proven as the worlds oldest crystal gemstone which developed more than 1.5 billion years ago while the first signs of life appeared on earth. Each crystal reflects its own journey frozen in time. Within this family of crystals, scientists have identified 23 Earth Elements and Minerals. The average crystal contains at least 17 of the following: Titanite, Cacoxenite, Lepidocrosite, Ajoite, Hematite, Magnetite, Pyrite, Goethite, Pyrolusite, Gold, Silver, Platinum, Nickel, Copper, Iron, Limonite, Sphalerite, Covellite, Chalcopyrite, Gialite, Epidote, Bornite and Rutile. The name auralite derived from the miracle of earth and sky connections, known as the Northern Aurora Borealis Lights. Native American Indians called this phenomenon The Dancing of the Spirits. Enjoy and treasure your beautiful, powerful true Northern Canadian Crystal Gemstone.